Tyres are integral to the performance of the vehicle by providing traction, braking, steering and load support. So, if you are looking to buy tyre it is important to better understand the various tyre types available so as to make the right decision in choosing the one that is best suited to you. Are you more a long-distance driver or a city driver? Do you want tyres that are high performance or have high durability? Depending on your need there are different types of tyres available which give solutions to any type of requirement. Considering the basic function of a tyre is to hold air, tyres can be of two types. A choice between one of the two is mostly related to the practicality of how your tyre will handle a puncture and the remedial actions required thereafter. In this class, the inner tube is separate from the lining of the tyre. In this case, the air loss in case of puncture will be almost instant. But these are very easily fixable. Also, it is much less common for the step to be ripped out in this type in case of a puncture. 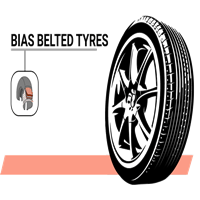 In this class, construction of the inner tube is integrated within the tyre. In case of puncture, the air loss will be very slow, and the vehicle will continue to run. They are also comparatively lighter than tube tyres which in turn increases the vehicle’s fuel efficiency. The disadvantages are that in case of puncture, it is much more expensive and difficult to fix. In this type, the cords are arranged perpendicularly to the carcass circumference. This type of construction provides good thread resistance and prevention of slipping even during cornering. Hence, this type is generally chosen for medium sized cars, small trucks and passenger buses. The carcass, in this case, is made of steel. This type of arrangement lends better driving comfort, acceleration and high safety controls to the vehicle, which are very important to high-speed travel. Construction of the chords in this type is done in an alternating criss-cross format. Hence it causes an angle with the road surface of around 40 degrees reducing the contact area with the road. This arrangement makes the thread sensitive to shifting weight and hence this is ideal for off-road vehicles carrying heavy loads, like agricultural and industrial vehicles. This arrangement is a combination of radial and bias types. This type does provide a less bumpy ride and better resistance to rolling as compared to bias tyres but not up to the mark and capability of radial tyres. Designed to be durable and functional, these may not be adept at handling extreme conditions and driving. These are made of a harder polymer to increase their life. A thread is designed to find the balance between reducing road noise at the same time handling wet and mud surfaces. Size can vary depending on the size of the vehicle. This type is suited for the sports car and sporty sedans. They are designed to provide high performance at high speeds as well as be durable. These are sleeker in design but have grooves along the circumference which succeed in dissipating the water on wet surfaces. These cannot handle frozen surfaces, hence should be avoided during snow. Specifically designed for 4-wheel drive vehicles, which would run on as well as off-road conditions. 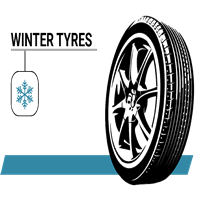 They are engineered with grooves along the circumference to have the increased traction to compromise mud, water, snow as well as roads with equal tenacity. They are mainly designed for pickup trucks, SUVs, and crossovers. 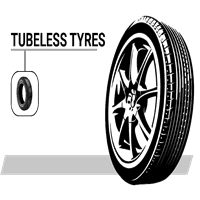 These tyres are also large in size to handle and balance the weight of the vehicle as compared to hatchback tyres. Originally only designed for cars belonging to VIPs, manufacturers are now planning on making it available to all so as to increase space in your vehicle as there will no longer be a need for a spare. These are specially designed tyres which do not get deflated even when punctured. Practically speaking they can hold off deflation for around 70 to 25 km. Everyone has their own driving style, conditions, and vehicle usage requirement. Before you buy, instead of blindly going by the highest rated brand or the most premium one, take a moment to understand what you are looking for in a tyre. Choosing the right tyre type by analyzing which would best suit you based on the various categories available can go a long way in improving your vehicle’s performance, fuel efficiency, and most importantly safety.